Well, the high-flying drama has left its thrilled fans with a happy ending and lovely memories. Time flies, when you’re having fun. Time also flies for me while watching this drama. Is it just me or is this drama really ended fast? One thing to be highlighted is that Descendants of the Sun has proved that an entirely pre-produced drama can lift up to viewers’ expectation and pleased them in the end. Descendants of the Sun tells a story of a brave and funny Captain of special force team Yoo Shi Jin (Song Joong Ki) who unexpectedly fall in love with a bold and beautiful surgeon Kang Mo Yeon (Song Hye Gyo). When the two thought their relationship has ended, they met again in a conflicted country, Urk, where they began to learn about nationality, friendship, hard work, loyalty, sacrifice, and finally, love. Well, my first impression of this drama is…ok. 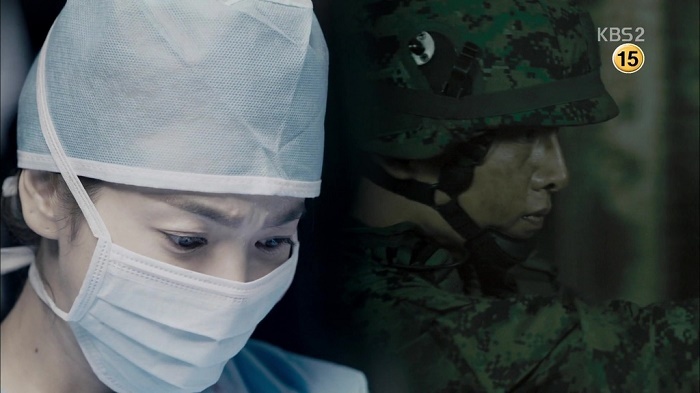 To be honest, Descendants of the Sun has not left an amazing first impression to me because the first two episodes of the drama showed similar formula to other melodrama-romance dramas. A slow-motion-gaze and hate-at-first-relationship showed in episode one looks really familiar and common. However, proceeding to episode 2, I found something different and enticing about this series. 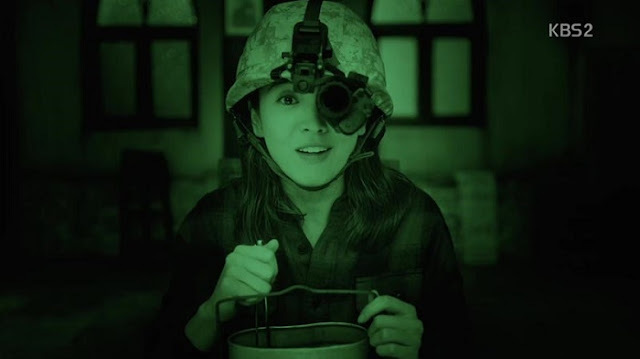 I’m not going to lie but the smooth and well-polished editing shown in episode 2 – that switches between Mo-yeon’s surgery and Shi Jin’s rescue operation in Afghanistan – is mind-blowing and changing my stance right away. I’m started to think that DOTS is a typical romance drama with a classy touches and elegant feels. In a gourmet world, DOTS will be a pricey filet mignon served by a polite and neat waiter/tress in a fancy and hype restaurant. It is basically a tenderloin steak you can get from a nearby bistro, but the difference between DOTS’ steak and nearby bistro’s steak is that the DOTS’ one is served in a graceful way, while the nearby bistro’s is more casual. For me, DOTS is getting more interesting and enticing when it was set in Urk. The fictional country gave so much color to the story and its characters. The ending of the episode 2 is definitely an attention-grabbing one for me. I’m attracted to know whether the main leads’ relationship will grow to a more meaningful one or will they finally realize that they cannot be together for good. Though, what hooked me straight away is the relationship between the second leads. Seo Dae Young-Yoon Myeong Joo’s love quarrel has captivated me the most. I’m tempted to know more about this pair, about their past, their future, and their struggle. Story-wise, DOTS offers something typical within atypical situation. I thought DOTS will be filled with heavy romance content, but it’s not. Though romance is listed as one of important parts of the show, from what I learned, the writer want to emphasize the story of doctors and soldiers who have to fight with time, bureaucracy, and unexpected situation to save humanity and uphold justice. The first two episodes of the drama not really showing the aforementioned purposes, but the rest of the show are showing it. Both main leads, Yoo Shi Jin and Kang Mo Yeon, have really strong idealism and personalities. Both of them are really believed in what they think is right and not afraid to express or show it. They also fiercely do their jobs – though those jobs are not always what their subordinate ordered. Romance-wise, DOTS proposes something mature and cute. The romance served in this drama is not a lovey-dovey or a puppy romance, it’s more mature, and really showed how adult – who already reached the age for marriage – handled their relationship. Tough choices, challenges along the way, and separation are among a lot of things Yoo Shi Jin and Kang Mo Yeon have to go through along their romantic journey. As for Seo Dae Young and Yoon Myeong Joo, a maturity is not what they aimed at because they already owned it. It’s a blessing and a nod they need for their unexpected relationship. Man alive, what did they feed him in the military service? 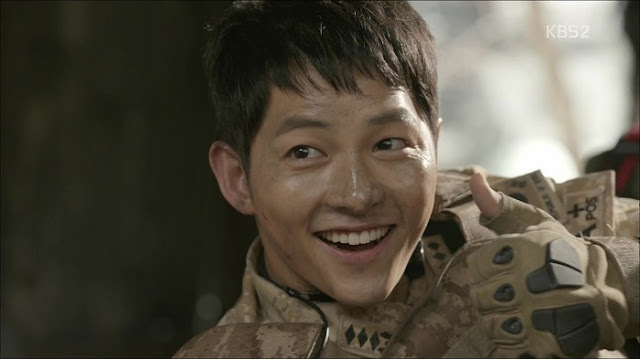 Song Joong Ki is undoubtedly grown well – both in acting and in physical appearances. His performance in DOTS is one of many reasons that made the show shot to fame. Song Joong Ki has proven to everyone that he is more than just handsome face in Nice Guy. However, in DOTS, he goes beyond my expectation of him. He definitely nailed Yoo Shi Jin character. I can’t imagine other actors – regardless of the fact that many prominent actors were said to have been offered the role before him – play this character as good as Song Joong Ki did. Though, on some points, he is still behind his co-star, Song Hye Kyo. I find SHK outperformed him in some scenes. But it doesn’t necessarily make him less talented than the actress. He reserves the right to stand beside SHK, even though his level is still slightly under the actress. 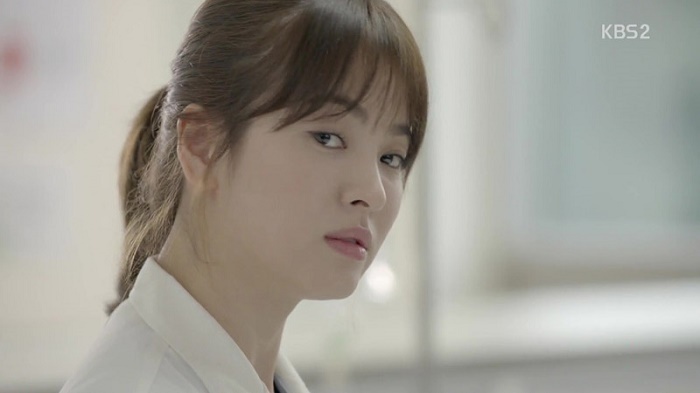 What I love about Song Hye Kyo’s performance as Kang Mo Yeon in this show is the fact that she is willing to let Song Joong Ki lead her and to not outshine SJK, though she still inadvertently beat him. I think I don’t have to put a lot of words for SHK’s performance in the show, because it will be filled with compliments and flattering remarks instead of criticisms and disappointments. She did good, wait, no, she did great. Period. Jin Goo reminds me of Ryu Joon Yeol. Both are not handsome but both are bursting with charm and alluring personalities. As Seo Dae Young, Jin Goo stole my attention from the main lead, Yoo Shi Jin. Unlike Yoo Shi Jin who is more expressive and explicit with his word, Seo Dae Young looks fragile and kept everything to himself rather than sharing it with others. Jin Goo managed to depict those particular qualities accurately. I hope, however, he can play more unique and unusual villain character in his next project. It will be fascinating to see him play villainous character. I don’t see any noteworthy difference from Kim Ji Won as Yoon Myeong Joo and Kim Ji Won as Yoo Rachel. She has already been talented since The Heirs era, but thanks to her character as Yoon Myeong Joo – which is more interesting than Yoo Rachel character – Kim Ji Won is now successfully known as one of the rising stars in the dramaland. I’m happy for her because she is really that talented and have the right to be recognized as the capable actress. Thanks to its fame and its A-list casts, DOTS has obtained a number of major celebrities to star as cameos. Started with the main lead’s best friend Lee Kwang Soo, to the female lead’s best friend Yoo Ah In. Both actors performed well and stick to its “cameo” role, without overdoing it. I adore the outstanding cinematography and camera techniques of DOTS. The production team is not wasting the amazing view and extraordinary sights in places the shot taken. They fully took use of it. My favorite cinematography is the poignant “reunion” of Yoon Myeong Joo and Seo Dae Young. The slow-mo, the casts’ expression, and the falling snow are perfect. As for camera techniques, my favorite is when Yoo Shi Jin and Kang Mo Yeon fell asleep when watching the movie together. It is beautiful. Just like its casts and production team, the OST of this drama is also filled with a number of familiar OST singers and popular figures, including Yoon Mirae, Gummy, Lyn, Kim Junsu, Davichi, and K.Will. Love every OSTs, but if I have to pick my favorite, it will be Davichi’s This Love and Mad Clown-feat-Kim-Na-Young’s Once Again. Oh, I also love the collaboration between Chen & Punch’s Everytime.